On May 19, the National Museum of Mexican Art, in partnership with Chicago’s Gads Hill Center, wrapped up a groundbreaking educational experience for children of low-income families from the south and south-west sides of Chicago. 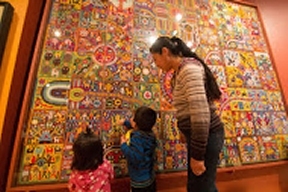 Listo para el Museo promotes cognitive growth in children 18-months to 36-months old by connecting hands-on sensory activities with artwork in the Museum galleries, igniting children’s developmental skills. Listo para el Museo educates parents/caregivers on the impact of visual art on their young child, offering ways to increase their child’s visual, cognitive, and language development, facilitating life-long learning and creating Museum go-ers of the future. The Museum has provided the pilot program to 45 toddlers and their parents and/or caregivers this year. The National Endowment of the Arts has noted a correlation between arts learning and improved academics. Yet, access to arts education is on the decline, and fewer and fewer schools use the arts to reach the neediest, most at-risk students. The National Museum of Mexican Art hopes to secure funding to continue the successful Listo para el Museo program in the 2016-2017 school year. To learn more, please call 312-738-1503 or visit www.NMMArt.org.